By Sean Barron | May 24, 2018 at 12:07a.m. Carl Nunziato found it easier to describe the feeling of having a veterans center named in his honor than in holding back his emotions. Nunziato expressed his gratitude during a dedication ceremony Wednesday in which the Youngstown State University Office of Veterans Affairs, 633 Wick Ave., was renamed the Carl A. Nunziato Veterans Resource Center. The facility on the YSU campus provides a variety of services for veteran students that include priority registration, tutoring, a student veterans group, access to counseling, educational benefit registration and certification and advocacy, its website shows. Nunziato, the late state Sen. Harry Meshel, Bernie Kosar Sr. and YSU alumni members and veterans were instrumental and securing approval for the resource center before ground was broken several years later. The 90-minute outdoor ceremony followed a name-reading event on the campus to remember 67 YSU alumni veterans who died in service to their country. 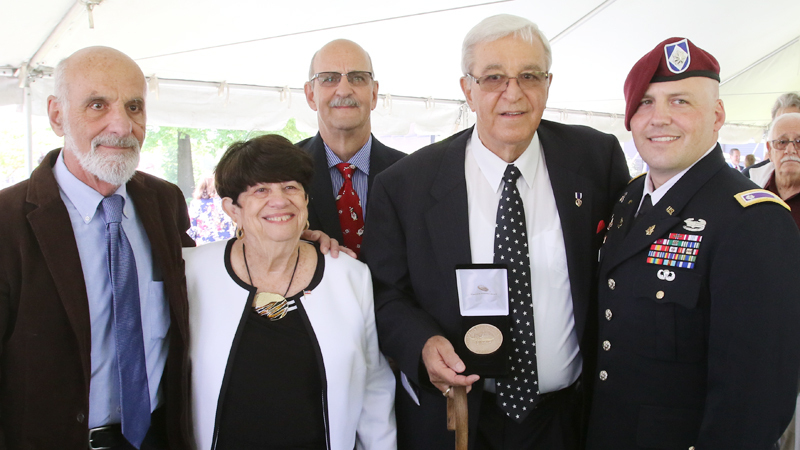 Nunziato enlisted in the Army in 1961 as a 2nd lieutenant. His career included two tours of duty in Vietnam, where he lost his legs in combat. In addition, he received the Purple Heart, along with several combat medals. The resource center is invaluable partly because it makes the often difficult transition from military to civilian life easier for veterans, many of whom have a “burning desire” to continue with their education to earn masters and doctorate degrees, noted Lt. Col. Gerald Nunziato Jr. of Fort Bragg, N.C., who’s Carl Nunziato’s nephew. The younger Nunziato, who has served nearly 18 years in the Army, explained many experienced veterans who are used to grooming younger soldiers in boot camp, for example, can find it challenging to acclimate to a classroom setting. Also thankful for Carl Nunziato’s contributions was Tom Ericksen, president of the Student Veterans of America’s YSU chapter. “He helped me and will help generations of YSU students to come,” said an emotional Ericksen, who also praised Nunziato for his help in stopping the closure of the university’s ROTC program in the early 1990s. Making additional remarks were YSU President Jim Tressel, along with Kosar, a campaign cabinet member with the resource center; Rick Williams, the center’s manager; and Nunziato’s brothers, Tom and Jerry Nunziato, who shared recollections of him. Nunziato also was given a special bronze medal bearing his name. May 23, 2018 12:32 p.m.
October 24, 2012 12:02 a.m.
September 27, 2014 12:08 a.m.
September 26, 2014 9:55 p.m.
October 31, 2009 12:03 a.m.